Damage Industries represents decades of experience in contract manufacturing and supplying the US, DOD, OEM manufacturers & commercial consumers with quality parts and equipment. We proudly offer quality defense products for military, law enforcement, and commercial clientele. Whether you require 20,000 springs for the M2 Browning machine gun, 30 MP5 stocks for your department, or a pistol grip for your home defense shotgun - Damage has what you need. 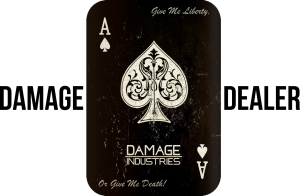 Damage Industries manufactures unique, military grade products for the defense market and offers products from reputable vendors who compliment the Damage Industries product line. We have the tools end-users requested to optimize the arms they have been issued: M4, AK, P90, SCAR, 240/249, M2 and MSAR STG556 are a sample of the products we support. Galil, MP5, 870/590 Shotguns are also represented. Qualified agencies can also order from our line of explosive breaching products.